There’s no reason to put up with a gap between your teeth. Our high-quality porcelain veneers are an easy solution for this and other problems such as crooked, chipped or stained teeth. Even better, our innovative technology enables us to work with you to design the personalized smile of your dreams. At Arboretum Dental, we’re dedicated to providing a friendly, calming atmosphere for patients of all ages. We welcome the opportunity to serve you and your family. Please contact us to determine if veneers are right for you. Veneers are thin shells of ceramic that bond to the tooth’s front and top surfaces. When they are bonded, they are virtually undetectable and look like healthy, white teeth. With proper care, they can brighten your smile for a long time. First, and most importantly, we meet with you to discuss what treatment plan is best for you. We’ll review the corrections available and create your entire case on wax models. After reviewing these teeth, you can easily make any changes. We can even create a composite in your mouth so you will see the exact results. In our office, there will never be any surprises—you’ll always get the smile you were expecting. During your second appointment, your teeth are lightly buffed to allow room for the porcelain veneer. 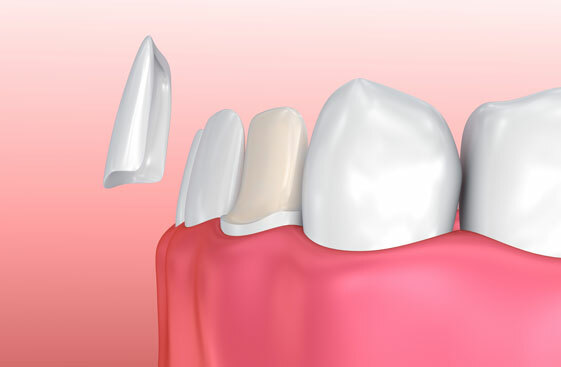 Because these veneers are very thin, only one half of a millimeter of your tooth is removed. Then, we take a mold of your teeth and send it to a local lab in Wilmington for fabrication. The veneer is ready in approximately two weeks. During your third appointment, we make sure your new veneers perfectly match the color of the surrounding teeth. Then, we use a special cement to bond them to your teeth. This is one of the great advantages of veneers. Maintenance is simple, and you’re able to brush as floss as you normally would—however, we do recommend using non-abrasive toothpaste. A diligent home care routine will ensure the best aesthetic result for your veneers. If you grind your teeth (bruxism), let us know. We can suggest a night guard to reduce the stress placed upon your teeth while you sleep.